Heat oven to 325°F. Spray 13x9-inch (3-quart) glass baking dish with cooking spray. In 2-quart saucepan, cook ground turkey over medium-high heat 4 to 6 minutes, stirring occasionally, until no longer pink; drain. Stir in seasoning mix from dinner kit and water. Cook as directed on box. Pour 1 can of the enchilada sauce into baking dish. Break taco shells from kit in half; layer half of the shells over sauce, overlapping if necessary. Top with turkey, onions and 1 cup of the cheese. Layer remaining shells over cheese. Pour remaining can of enchilada sauce over shells, coating well. Cover dish with foil. Bake about 30 minutes or until hot and bubbly. Remove foil; sprinkle remaining 1 cup cheese over top. Bake uncovered about 15 minutes longer or until cheese is melted. Top individual servings with lettuce, sour cream and taco sauce from kit. 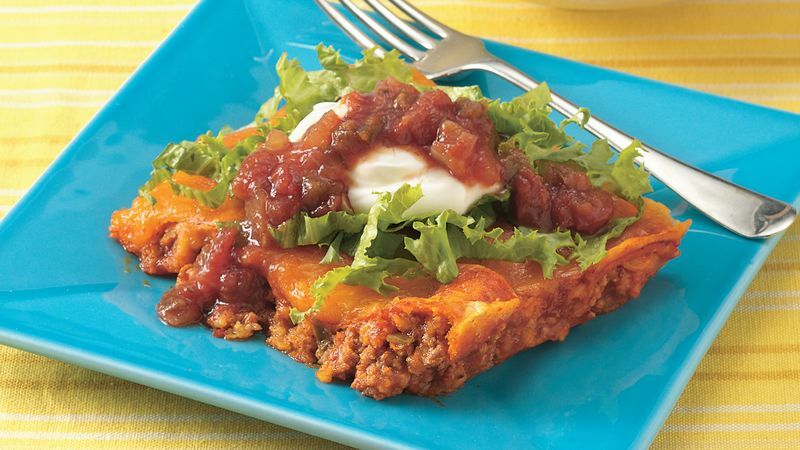 Red enchilada sauce is more commonly available, but green chile enchilada sauce--with its milder flavor--can be used instead.